You may have heard that we’ve launched our first ever #BetterTogetherCA online book club. Throughout the month of March, we’ve been reading “Kids Deserve It” and reflecting on questions posed by teacher moderator Angela Barnett. 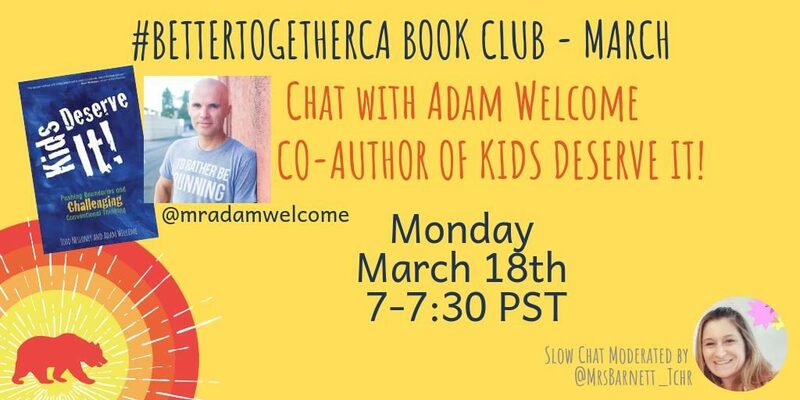 We’re thrilled to share that Adam Welcome, co-author of “Kids Deserve It,” will join us on Monday, March 18th at 7 PM for a 30 minute chat about the book. Simply log on to Twitter by following and posting with the hashtag #BetterTogetherCA to participate. We look forward to the conversation!